It’s long overdue but it’s time for the final review of the Kona Project 2 Messenger Bag! The folks at Brenthaven and Kona teamed up and created the Kona Project 2 Messenger Bag and were nice enough to send us one to test! I wrote my first impressions of the bag awhile back and gave an opinion of it. After some time, my impression has stayed pretty much the same—I like it. The first thing I noticed about it is how stylish the bag is. To my hipster friends who treat bicycles as an accessory like some who purchase cars that “fit” their personality, this messenger bag is a good complement to their everyday life. Like I mentioned before, it’s got a very streamlined design—nothing looks out of place from the trapezoidal shape of the bag to the inclusion of metal buckles and emblematic light in the middle. It’s quite a spacious bag. Even the two zipper-pockets (shown below) were quite roomy; in the larger zippered compartment I was able to put in two medium-sized shirts unfolded without a problem. In the smaller compartment, a wallet, cell phone, toothbrush and toothpaste can fit. 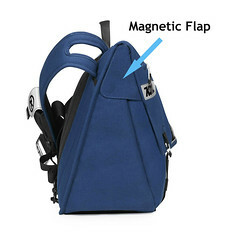 The bag’s main compartment is kept closed by three things—Velcro, two buckles and two side magnetic flaps. Inside, the bag is separated into three compartments with the middle being a “pouch” that can be closed via Velcro. Turned around, the bag maintains its functionality. The wide adjustable strap is held together by a big metal buckle. The strap also has a pouch for a cell phone. The bag also has an additional smaller strap that buckles onto the main strap to keep the bag stable while riding. When I first received the bag, the first thing that I wanted to know was how this bag was any different when compared to my current laptop-backpack. This meant: did I notice how uncomfortable I was with the bag on during my commute? Or is it such a good fit that I don’t even notice that I have it on? I did a couple tests to find out. One test was to overstuff the bag, and the other test was to only put in essentials for work. And then I was off for a short ride. During the ride, I found the bag to be so heavy that I had to stop to give my shoulder a break. With each bump in the road, the pain I felt increased. I had to stop and switch shoulders three times in order to finish the ride despite the well-padded strap. Even though the bag is durable enough to withstand over thirty pounds of load, I would only recommend a lighter load equivalent to a laptop + charger, a change of clothes and a pair of shoes. In other words, try to keep the bag’s weight under fifteen pounds. That said, I think my opinion on how much load I would carry with the Kona Project 2 would change if the bag had two straps that distributed the weight better like a backpack. On a side note, I used the bag much like a duffle bag while spending weekends at a friend’s and it served me well. Since it could hold more than my backpack, I found the Kona to be much more useful than my backpack. So, in short, the Kona Project 2 Messenger Bag is well-designed and quite suitable for the commuter on a bicycle. The guys at Brenthaven designed the bag with storage, visibility and style in mind and it shows. For the commuter who does not have to carry that much stuff and can afford a hundred dollar bag, this bag is worth a look. One thing we did differently this year was to host our own raffle. We gave away KHS Bicycles swag and PricePoint.com products by Sette. We held two raffles, one at noon and one at 1pm. Basically we told people that they can enter to win all sorts of goodies, and the ticket was free! Forgive us if we can’t remember your names, it was hot and we talked to so many people that day. Dorothy from the Los Angeles Bicycle Coalition won some KHS Swag. She won some KHS Swag. We had also donated some more PricePoint.com Swag to the Cicle.org raffle. These items included messenger bags, back packs, pumps and gloves. Towards the end of the day, Cicle.org held their raffle. They were giving away all sorts of goodies. This lucky fella won some hibiscus print Sweetskinz tires. Unfortunately it was so hot that the organizers decided to the raffles after the event in their headquarters and notify the winners by phone. I don’t blame them…it was bakin’ that day. We have more to report so stay tuned! Yup I found a video that I took of a company called FatSak Bags. It’s a pretty cool bag where you can bring all sorts of stuff with you. Check this out, the left one is the Commuter Back Pack that I reviewed, then on the right is a BIGGER Commuter Back Pack that will be available in Spring 08. It has about 2000 Cubic Inches of storage. The old back pack only had 1500. Here’s Moe holding another item that will be ready for Spring 08, a smaller messenger bag. They also went away from the tarp-like material and went with a ballistic nylon. They went with a gray inner liner, they said the white on the original bags would get dirty too easily. Plus this bag is a switch hitter. Meaning you can have the shoulder strap go either on the left or the right side. The Banjo Brothers are super cool guys and we’re pretty excited about the new things that will be coming out next year.